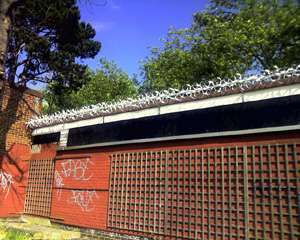 - the versatile all round perimeter security device that can be used almost anywhere! 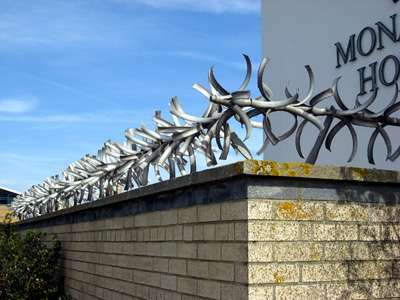 This practical, Vanguard anti climb barrier perimeter security system gives you a rotating anti climb barrier system manufactured from split and formed aluminium tubing. The Tri-Wing vanes thread onto a central spindle to form a robust rotating barrier of any length and approximately 400mm diameter. Do you need a Natural or a Coloured Finish? Vanguard is supplied as standard with a natural aluminium finish or can be supplied in any standard RAL Colour to special order. The Black painted finish is a favourite with churches and other historic buildings as it blends in well with the black cast iron guttering, grilles and down pipes often in evidence, while a Green finish is frequently requested for trackside use by the rail network or by users where installation in a rural environment is planned. Where can you use Vanguard? - Drain pipes, soil stacks, etc. When Insight was approached to provide a security solution for use within a major new Liquified Natural Gas facility in Singapore, it was obvious that different time zones and 10,000 kilometre distance between the Insight and customer project teams would be an added challenge. 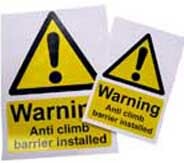 Warning signs must be displayed where anti climb products are in use. Is Vanguard the right solution for you? by their very nature, anti climb systems could cause injury to anyone attempts to climb over them. Certain restrictions therefore apply as to where and how they can be installed. Note: we have noticed that our customers use various alternative spellings for this product including vangard, vandguard and vandgard among others, however all refer to the product shown here. Not sure which is the best solution for you?